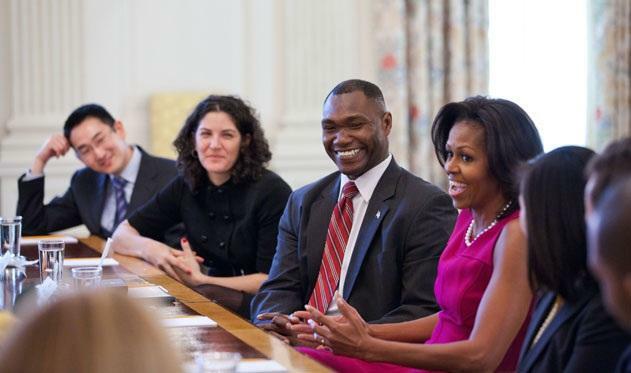 FEBRUARY 28, 2013 – RODNEY LEWIS, AN AIR FORCE officer who worked with the First Lady on veterans’ issues, has received the first scholarship to Georgetown’s Center for Public & Nonprofit Leadership (CPNL). A total of five leaders working on behalf of veterans will receive scholarships this year, made possible by a $100,000 anonymous gift to CPNL, a center within Georgetown’s Public Policy Institute (GPPI). The gift, from an anonymous veteran and GPPI alumnus, will fund the scholarships as part of the center’s new Veterans Nonprofit Leadership Initiative, which will include research and public issue forums that highlight current best practices in serving the needs of veterans and their families. The initiative’s research specifically will focus on innovative cross-sector collaborations that can be replicated in communities across the country. Five full-tuition scholarships to pursue a Nonprofit Management Executive Certificate Program will be awarded this year, with an additional five scholarships provided in 2014. The scholarships will be offered to individuals leading veteran-related nonprofit organizations, or to veterans or spouses of veterans working on behalf of veteran-related causes. The Nonprofit Management Executive Certificate Program prepares students by teaching them about the current trends, challenges and best practices in nonprofit management, and links them to a local and national network of nonprofit leaders. The part-time program already has trained more than 850 individuals to lead high-impact nonprofit organizations. Lewis, a colonel in the U.S. Air Force who serves as chief, Legislative and Interagency Liason in the United States Transportation Command, is a 1991 graduate of the United States Air Force Academy. He also holds a master’s degree in systems management from the University of Southern California and a master’s of science in strategic leadership/international relations and public policy from the Air Force Institute of Technology. Among his many awards and decorations is the Bronze Star. As a White House Fellow from 2011 to 2012, he worked for First Lady Michelle Obama on her Joining Forces Initiative, dedicated to connecting servicemen and women with the resources they need to find jobs at home. Lewis was one of two people responsible for a national initiative leading an effort to translate military skills into employment opportunities for veterans and military spouses, working closely with nonprofit and private industry. The White House announced in August 2012 that a total of 125,000 veterans and spouses were hired or trained as a result of the Joining Forces Initiative, exceeding the challenge President Obama posed to private industries in August 2011 to hire and/or train 100,000 veterans by the end of 2013. The scholarship expands on GPPI’s dedication to veterans. Each year, the institute’s Master of Policy Management program includes 20 of the Army’s most accomplished captains and majors, who go on to hold internships in the Joint Chiefs of Staff office and the Office of the Secretary of Defense the following year.